The Ram Recruiting Report: Let's take a break from recruiting to talk LARRY SANDERS DRAFT MANIA! Let's take a break from recruiting to talk LARRY SANDERS DRAFT MANIA! While VCU is in great shape with the last 2 of their top 3 guard targets (Henry was the first) and we should get a commitment from at least 1 before June 20th, things have otherwise been somewhat quiet as the off season drags on. One nice thing that can keep VCU fans in basketball mode is the media buzz surrounding our very own junior Larry Sanders who has decided to forgo his final year of eligibility to go to the NBA. Here is ESPNU's breakdown of Larry Sanders and some footage of him from the combine. He shows a pretty nice 3-point stroke hitting almost 50% of his shots behind the college line. Of course VCU fans know all about Larry's 3-point shot. CBSSports.com has also done a minute long segment of highlights on Larry Sanders which can be found here. Last week the Indiana Pacers worked out Larry Sanders in what was his first NBA workout leading up to the draft. The Pacers hold the #10 overall pick in the first round of this year's draft. Sanders was the only first-round prospect in a group that also included Sylven Landesberg (UVA), Gani Lawal (Georgia Tech), Mikhail Torrance (Alabama), Dominique Jones (South Florida) and Aubrey Coleman (Houston). Here are the highlights of the May 17th workouts in which Larry Sanders performed pretty well. Several NBA fan sites and draft sites have articles out discussing the possibility of Larry joining their teams including the OKC Thunder, Chicago Bulls, Toronto Raptors, Milwaukee Bucks, Memphis Grizzlies, San Antonio Spurs, and Boston Celtics. All of the major mock draft sites have Larry Sanders going in the first round ranging anywhere from 13th to 28th overall. 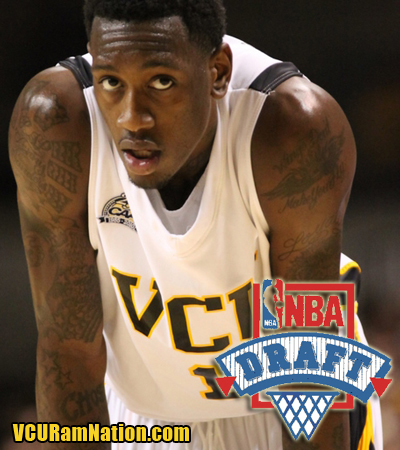 It will be interesting to follow the draft process and we have to thank Larry Sanders for reinforcing VCU as a plausible program for NBA-caliber players. Both Juvonte Reddic and Pierria' Henry have stated that as an important selling point in passing over such programs as Oklahoma, Mississippi, and Maryland (in Reddic's case), and West Virginia, Dayton, Xavier, Arkansas, and Virginia Tech (in Henry's case). Let's hope we'll have more of these players giving us good news in the offseason leading up to the NBA draft. 2 NBA first-rounders in 2 years is pretty darn good for a mid-major program like VCU. Let's hope the trend continues! Good luck to Larry throughout the draft process!